The Lake Harmony Watershed Preservation Group (LHWPG) is a non-profit organization that collaborates with various other groups involved with the Lake Harmony community. Hanover Engineering has provided engineering and environmental services related to the lake and its watershed. Throughout the community’s history, high recreational use on the 118-acre lake and land development activities within its 491-acre watershed have created several challenges in preserving the quality and natural integrity of the lake. Previous studies Hanover Engineering conducted showed sediment accumulation reaching thicknesses up to 13 feet. Substandard roadways, leaves, winter maintenance materials, and lack of stormwater Best Management Practices (BMPs) all contribute to degradation of the lake quality and accumulation of sediment. 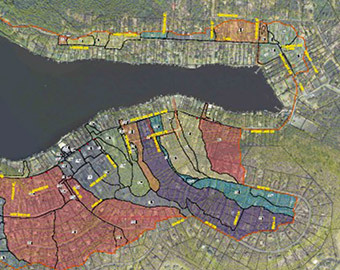 Hanover Engineering performed a watershed-wide analysis to determine how stormwater carrying sediments, nutrients, and other pollutants flow into Lake Harmony. High priority areas for correction were identified from the analysis, and conceptual designs for each drainage system were developed using cost-effective BMPs. Potential projects were ranked based on pollutant removal, logistical concerns, and cost considerations. The report allows the LHWPG to readily prioritize and select projects that will best improve water quality, recreation, and aesthetics within their community. Hanover Engineering has been continually working to assist the LHWPG with detailed design and permitting of projects, as well as coordination and public outreach.